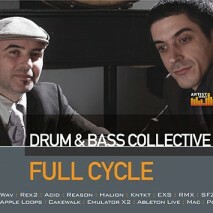 Full Cycle – Drum and Bass Collective | Joomla! The Full Cycle camp is almost directly synonymous with Drum'n'Bass's "Bristol sound", both being primarily associated with Roni Size, DJ Die, DJ Suv and DJ Krust. 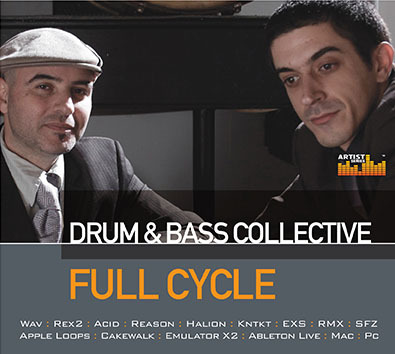 In the late 1990’s, Full Cycle was at the peak of its creative powers, the Reprazent project had brought Drum & Bass to the attention of the masses and Full Cycle was the crew’s spiritual, underground home. The breaks were recorded live at Full Cycle / Channel House studios in Bristol and everything was recorded using high end vintage outboard equipment and then processed digitally. “All of the sounds in this collection are original, created from analogue and software synths and live instruments. What we’ve tried to do is give you a collection of samples which you can use over and over, that you can rely on when you need that certain sound quickly, to keep the creative process flowing!”….D Product.